Greek food is a wonderful mix of oriental and European dishes, cooked using different methods, from frying to broiling to boiling. 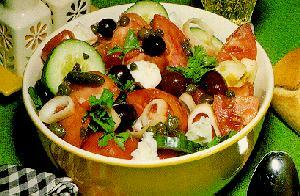 Food in Greece is both easy to make, as the following recipes show, and delightful. 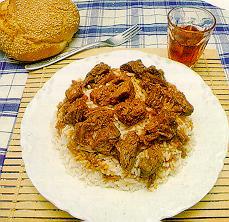 Much of Greek food is seasonal and alot of it is prepared during different times of the year, mainly around dates of religious events, such as Easter, Christmas or New Year. 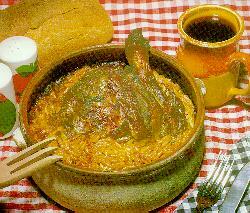 Greek food, uses much tomato paste in a liquid form. If you get a can of peeled tomatoes and mix them well, it will produce an appropriate paste. In recent years, medical evidence has shown that eating a high quantity of tomatoes, results in lower cancer rates. Perhaps this is the reason why Greece as a country has low cancer rates. On the other hand, the incident rate of heart and stroke diseases increases every year. In the recipes given below, some of the ingredients may not be available in your area, thus arternates are given, trying to keep the original taste intact. 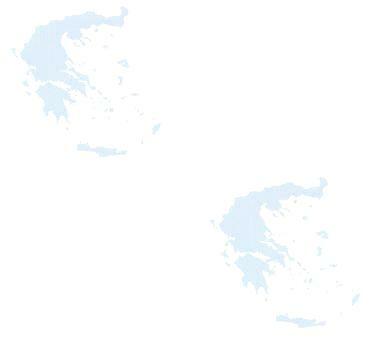 However, this may not be possible, and no matter what a Greek restaurant in your area says, Greek food is only Greek food when prepared in Greece. I suppose this is true for Texas T-Bone steaks as for Greek food, right? Just one more reason why you should go there and experience it yourself! The following are some of the easiest recipes that anyone can make and turn a dinner into a Greek treat. 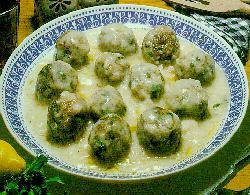 Kal� �reksi (Bon Apetit)! An easy to make recipe for all! Put the oil in a large saucepan and heat. Put the onion slices in to cook and turn them until they start turning brown. Add the garlic, salt, pepper and oregano. Place the potatoes, the sugar, and the water in the pan. Add the peeled tomatoes. Mix well. Let it boil for 10 minutes. Then add the first ingredient(any of the chosen vegetables). As it starts the cook, the water will slowly evaporate and then, about 30-40 minutes later, remove from fire. 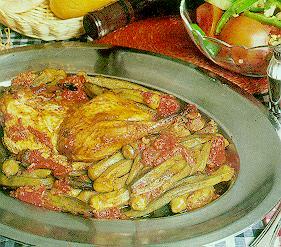 This way you can make any of the 'lathera' dishes of Greece; great healthy food! Put the yoghurt in a bowl. Put the garlic through a garlic press and using the edge of a knife, spread the garlic coming our of the press on the yoghurt. Take the cucumber and peal the skin. Slice it thinly, either with a knife or using a salad slicer. Mix the ingredients with a mixer (or a fork) and slowly add the oil. 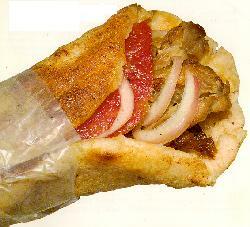 The oil will be absorbed, and when it is done, the tzazki is ready. Serve with a spoon and a few olives spread on the top. Tzaziki is eaten with plenty of french bread. Fry the onion in the oil until slightly brown. Add the water (should be boiled), pepper, salt and let it simmer at low fire for about 5-10 minutes. Mix the cornstarch with some water, and pour it into the soup. Stir for a few minutes and the soup will thicken slightly. Toast the slices of bread and put them on plates. Pour the soup on top and sprinkle with the grated cheese. Put the eggplants in the microwave or normal oven, and cook until it feels very soft(about 10 minutes in the microwave/40 minutes in a normal oven). Using a sharp knife, slice in half, and using a spoon, remove the inside 'meat' and place in a bowl. If the eggplants are well done, the inside should come out very easily. Put the garlic cloves in a garlic press and spread the garlic on top of the eggplant. Using a fork, start mixing the garlic and the eggplants together, and spread the oil a little at a time. When the oil is absorbed, the salad is done. Put in a fridge to cool down and serve with sprinkled parsley. 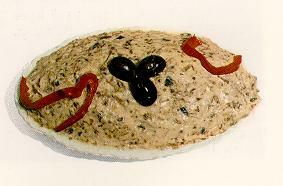 Eggplant salad (also called poor man's caviar) is eaten with French bread. This dish can be done in triangle sized chunks. After you butter the fillo and you put the filling in it, fold it in single triangles and place them on the oven dish. Crush the Feta to a paste, add the bechamel sauce, and the eggs, while stiring well. Add the salt, pepper and nutmeg. Line the baking pan with oil, and then place about 6-10 sheets of filo, buttering them on each side. Pour the batter and flatten with a spatula. Then continue with the rest of the filo sheets (should be about 20-25 in a package). Trim the edges and with a sharp knife, outline the serving squares on the top sheet (you dont have to actually cut them, just press the knife on the top surface to mark them - they should be about 2 inche squares (5 cm). Bake in a moderate oven for about 30 minutes, or until the top sheet is dark brown. Now cut the squares you marked earlier and serve, after letting it cool a little. Remove the stems from Okra (if fresh). Wash, drain them and place on a dish. Sprinkle salt, vinegar and pepper. Put this to the side while you prepare the rest. Fry the onions in the olive oil till broan, add the tomatoes, sugar, parsley, salt and pepper. Simmer until the tomatoes are dissolved fully. Add the okra to the mixture, add some more water, and boil ror about 30 minutes, adding water. If the spinach is raw, cook and slice thinly. If frozen, defrost. 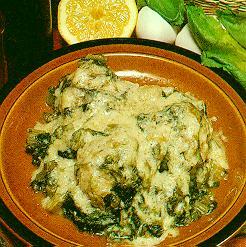 In either case, mix the f�ta cheese with the spinach to make a mixture, adding the chopped garlic. Spread some butter on an oven tray. 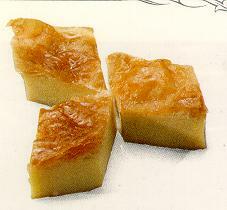 Open the f�lo package and place each thin pastry (it is as thin as paper) on the tray, buttering each one using a brush. After you have done 8 f�lo slices, place the spinach/f�ta mixture and spread over the entire oven tray, covering the 8 pastry slices. On top of this, place the remaining pastry slices, buttering each one of them as well. Notch the last one creating 2 inch (5 cm) on a side, squares. Place in a medium heat oven and cook till brown. Mix the meat with the mint, the egg and the onion. Season with oregano, salt and pepper. Form into egg size balls. Heat the oil. 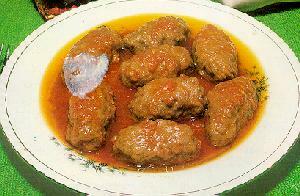 Roll the meatballs in flour and place in the hot oil. When turning brown, turn, cook other side and serve hot. 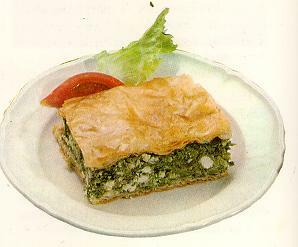 For just plain old Mousaka, remove the potatoes, however it is normally served with them. Boil the potatoes and stop half way. Peel them and let aside. Fry the onion in the oil till brown, add the ground beef, wait 10 minutes while stirring, and add the wine, tomatoe, parsley, salt, pepper and about a tablespoon of sugar, and then add 1/2 cup of water. When the water is absorbed, remove from heat, and add the grated cheese and the egg yolks (keeping the egg whites for the topping. In a saucepan bring three cups of milk to boil, mix the flour with the remaining cup and pour stirring constantly, making a thick paste - if too thick, add milk, if too thin, add some more flour. Remove from heat, and add the egg yolks, egg whites and the nutmeg. Butter a baking pan, and put the sliced potatoes in it. Cover with the meat mixture and then cover with the contents of the saucepan. When the topping turns brown, serve cool. Heat the oil in a big pot (medium-high setting). Place the cleaned chicken in the pot and turn, to brown all the sides evenly. Add the tomato juice and add the same amount of water, plus the sugar. Let it boil for an hour, until the chicken is starting to come apart. The water would have evaporated by now, leaving a thick red sauce. Add �kra if desired. Serve with fries/chips. Clean the eggplants and slice them, in 1/16 inch (3mm) slices. Put the oil in a skilet and heat. Take an eggplant slice at a time and cover it with the egg mixture. Place onto the skillet and cook for a minute or so. Turn and cook other side. Repeat until all of the slices are done. 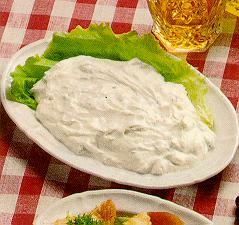 Serve with Tzaziki. Chop the onion and brown in a pot with the oil. Add the meat and brown the sides. Sprinkle salt and pepper. Add the sugar, cover with the tomato juice and add the same amount of water. Let cook for an hour or more until the meat is soft (in a pressure cooker it takes 20 minutes). 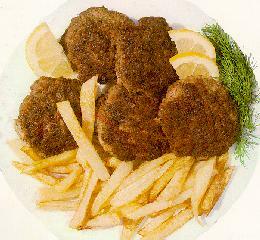 Serve with rice or fries/chips. Mix all the ingedients together, and mould into round 1 inch / 2.5cm balls. Put some water in a pot, place the butter and balls in it carefully. Let them cook for about 20 minutes and then let cool. In a separate bowl, beat the eggs with a mixer and slowly, while beating, add the lemon juice ensuring that the sauce doesn't curdle. With a ladle, take some of the juice from the meatball pot, add to the sauce, all the time mixing. Keep doing this until all the juice has been mixed in the sauce. Empty all the sauce on top of the meatballs and serve with some sprinkled parsley. FOR Baklava replace the milk-semolina mixture below with a mixture of walnuts, honey and cinnamon. Using a brush coat an oven tray with melted butter. Add each one of the filo pastry sheets, one on top of another, until you have coated 8 of them, and put them on the tray. In the meantime, empty the milk in a big pot, add the semolina and vanilla, and bring to boil, all the time vigorously stirring with a wooden spoon. The mix should be like a thick surup (like a fruit jam - must not be too thick). Remove from the fire and leave aside to cool for 5 minutes. Empty the semolina mix onto the oven tray and spread it around so that the entire tray is filled. Continue adding the remaining of the pastry sheets, buttering each one of them until you have added them all. Using a sharp knife, notch squares, about 5 cm per side (2 inches). Put in the oven and cook until brown. Remove and let cool. In the meantime, place the sugar in a pot, add the water, the second vanilla essence and the grated orange peel. Bring to boil and let cool. Pour the surup over the semolina mix and place in fridge. This is a delicious desert and well worth the effort. Must be kept in the fridge as it contains milk. Put the rice in a large pot, add water and boil till very soft (should be fluffy and thick). The water should have almost evaporated. Add the milk, the lemon rind and the sugar. Let boil at a setting which would not let the milk overflow. When it thickens, remove from stove. Pour in individual bowls and let cool. Sprinkle cinnamon and serve.